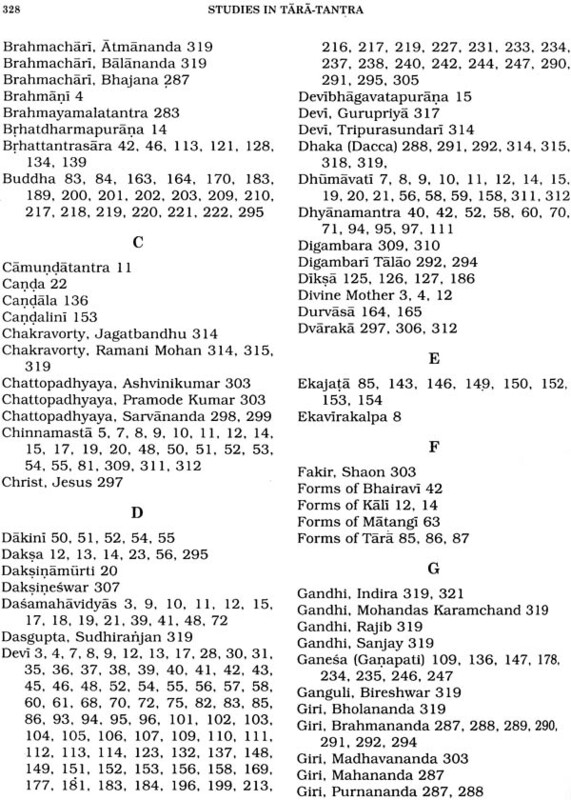 This book "Studies in Taratantra" is an exhaustive and exclusive study on the Taravidya that was practiced by Lord Buddha, Planted in India by Vasistha, spread by Acarya Brahmananda Giri, revealed by Bishekhyapa, nourished by Kaulacarya Anandanatha, illumined by Raja Ramakrishna, enkindled by Acarya Moksadananda, exposed by Kailasapati Baba, unfolded by Sadhaka Varna-khyapa and glorified by Anandamayi Ma. 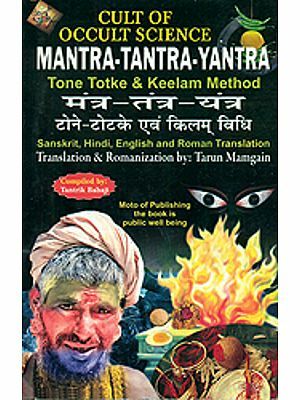 It contains the original texts of Taratantra and deals with the Tara-cult including the form of Tara, mantras of Tara, Taradhyanas, Tarakavacam, Taradiksa and detailed methods of Tara -worship. 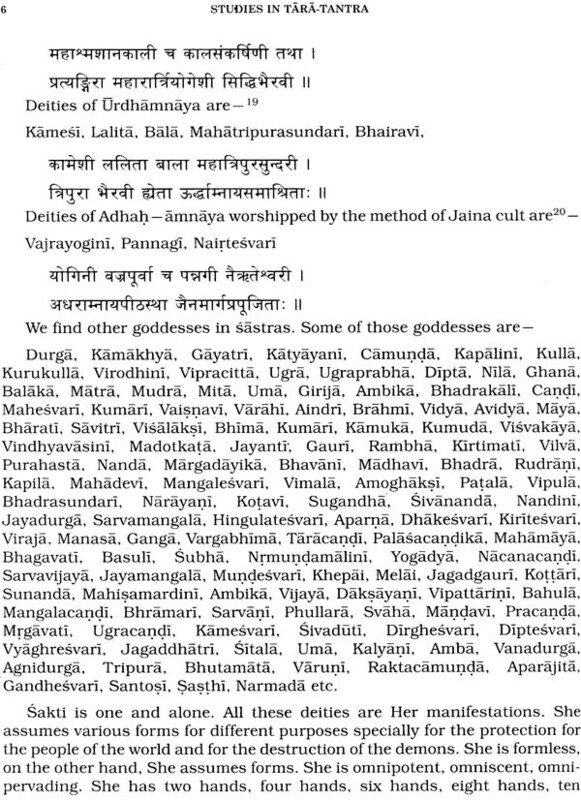 This book is enriched with the origin myth of the Dasamahavidyas, origin of Kali, Bhuvanesvari, Chinna-masta, Dhumavati, Vagalamukhl, Matangi and Kamala; Their forms and mantras, Vasistha's penance, history of Tarapitha, Taratemple, Mahasmasana and Jivitakunda; short life history of Acarya Brahmananda Giri, Sadhaka Bamakhyapa (Vamakhyapa) and Sri Anandamayi Ma and also reference to Jesus Christ's visit to Tarapitha. 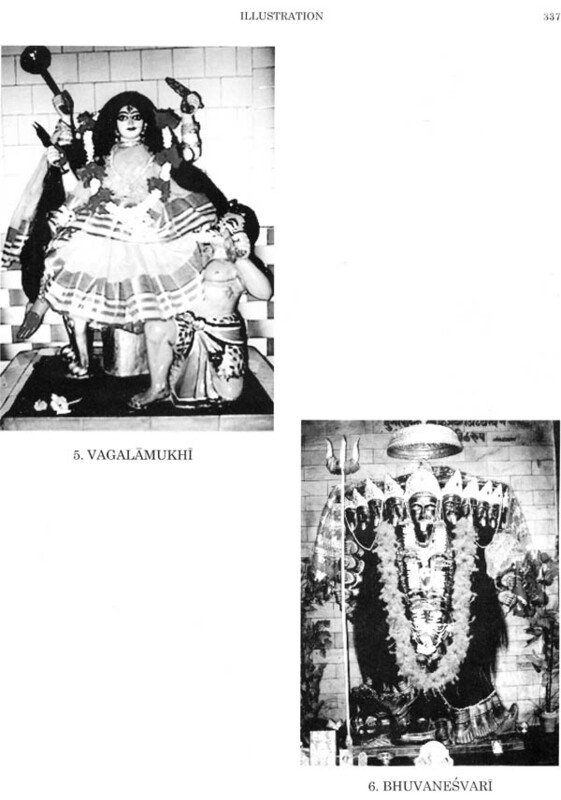 I was born and brought up in a pure Sakta Kayastha family surrounded by a good number of Sakta Brahmin families in a village where animal sacrifice (pasubali) was a common and compulsory ritual in the Kali Puja, the Manasa Puja and the Durga Puja in the houses of these Sakta families and also in the Barowari temples. 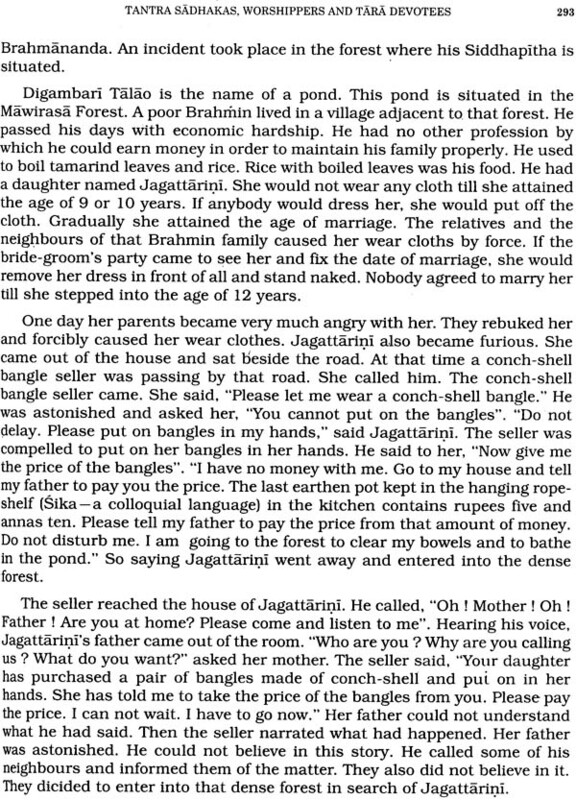 We used to wear the marks of blood oozing out of the cut heads of goats in the midst of the sounds of the beating drums, bells, conch-shells, ulus (sounds uttered by women) and triumphant out cries like "Jai Ma Kali, Kali Mai ki Jai". 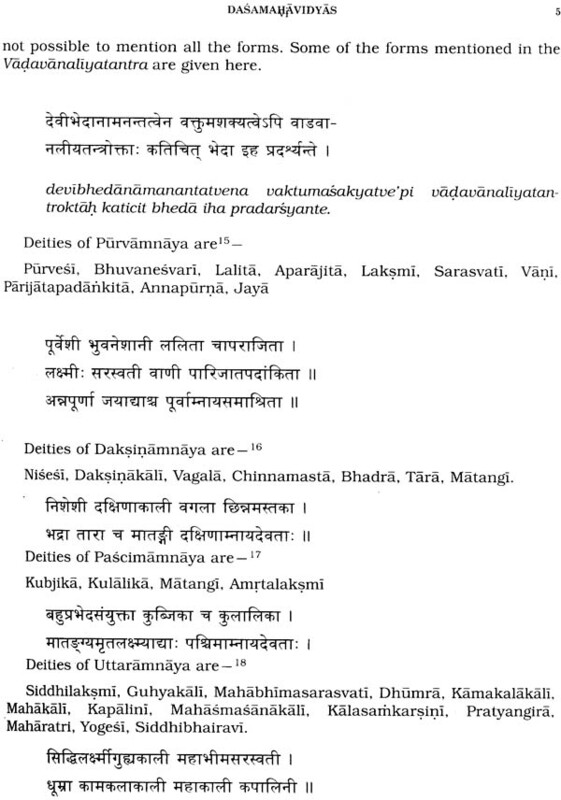 In our childhood we spent nights at the places of the Tantric rituals in connection with the Cadaka Puja in the Caitrasarhkranti (last day of the month of Caitra, in English Calendar 14-15 April). 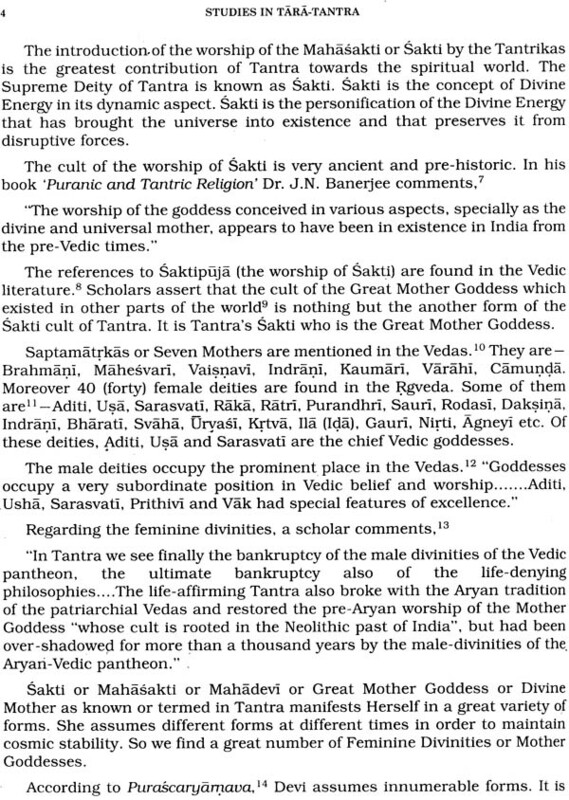 Moreover, my father, a devout worshipper of Mother Kali, was initiated into the Saktimantra in his dream by a renowned Tantrika Guru who died many years ago. 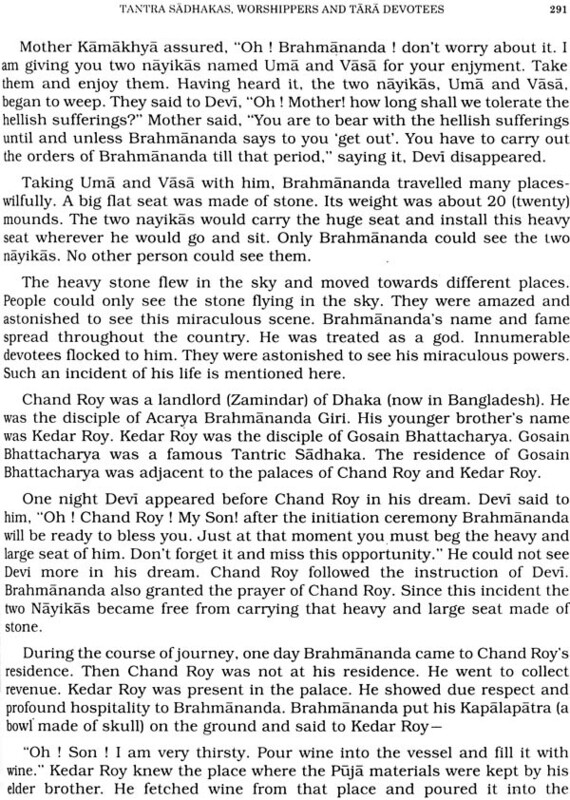 Before his death in East Bengal (undivided India) he promised my father that he would initiate my father even after death. He kept his promise. He died in 1946, but initiated my father in 1961 in West Bengal. This is a miraculous incident that cannot be explained. 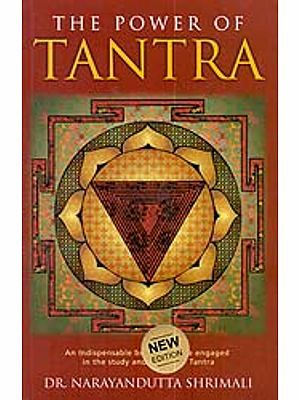 These factors sowed the seeds of Tantra in my adolescent mind. 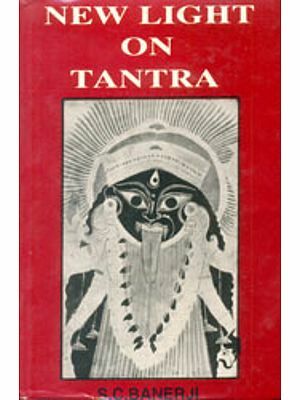 The plant of Tantra began to spread its branches in my mind when I was studying at Calcutta University. I, accompanied by my revered maternal aunt (Prabhavati Nag, Behala, Kolkata) visited Kalighat. 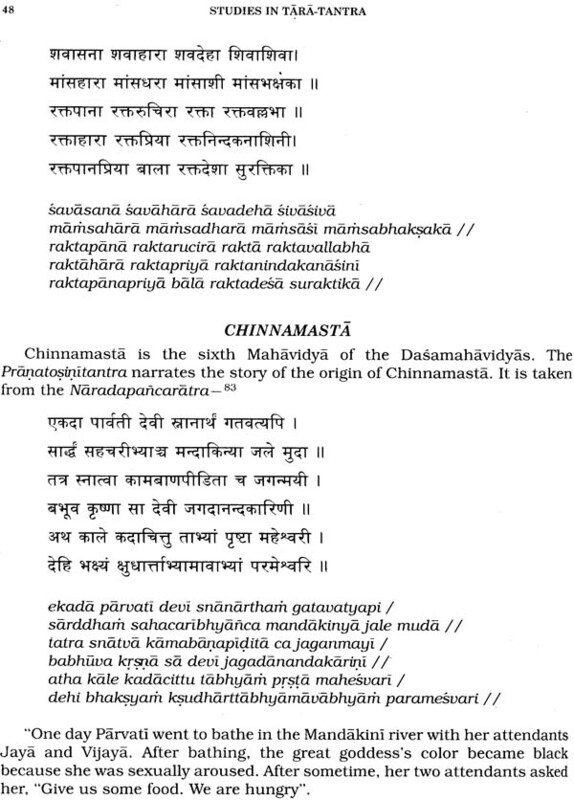 Adyapitha and Dakshineshwar frequently. 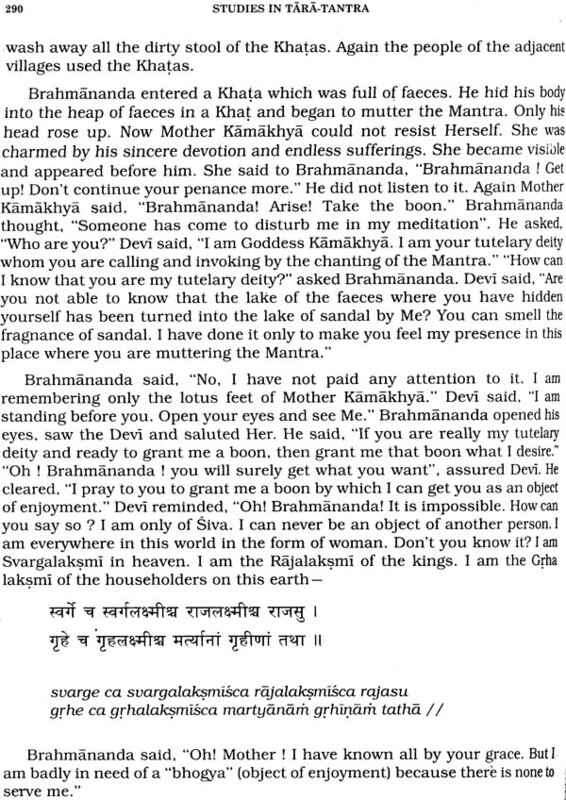 I visited Tarapitha for many times, offered Puja, bathed in the Jivitakunda, roamed around the great cremation ground, spent nights, met Sadhakas, witnessed the outer changes, had talks with the Swamijis in the office of the Bharat Sevashram Sangha founded by Yugacarya Swami Pranabananda Maharaj and wondered at the increasing number of Tara devotees, dharmashalas and standard hotels in this small place. 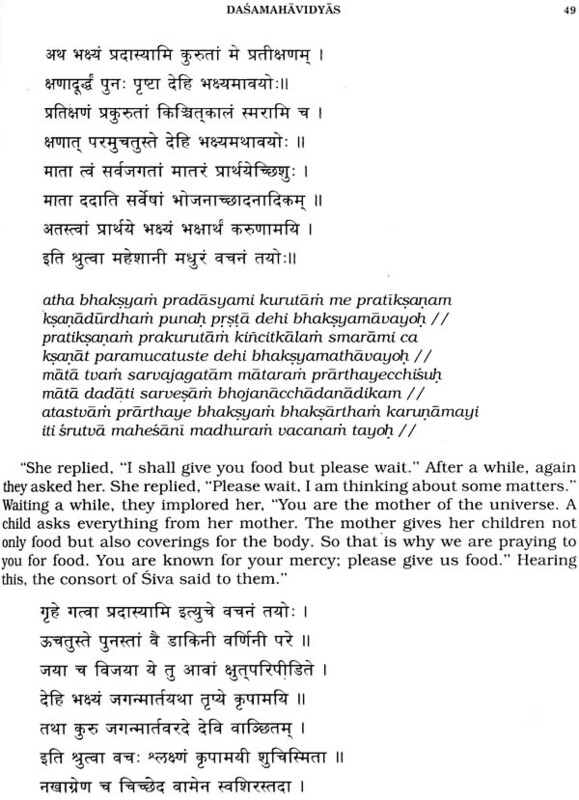 But I did not think of writing any book on Mother Tara at that time. Then I was busy with my preparation for the post-doctoral studies. 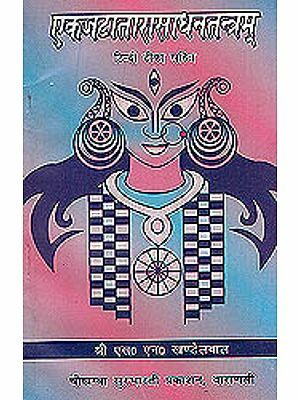 Suddenly Mr. Prashanta Kumar Bhattacharya, a devout Tara worshipper and proprietor of Punthi Pustak, dialled me and entrusted me with the task of writing a book on Ma Tara. It was a herculean task for an ordinary teacher like me to perform this task successfully. At last the most impossible task was made possible by the grace of Ma Tara and the blessings of Swami Pranabananda Maharaj. 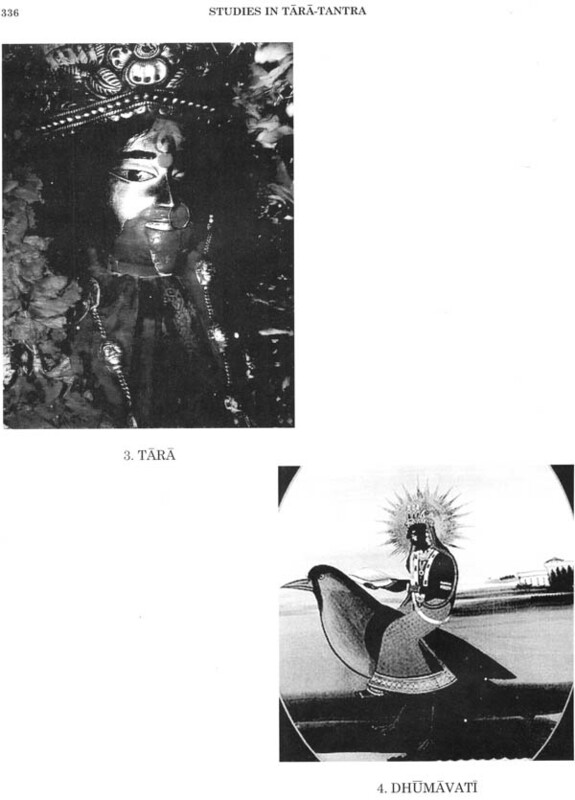 This is how this book entitled 'STUDIES IN TARA-TANTRA saw the light of the morning. 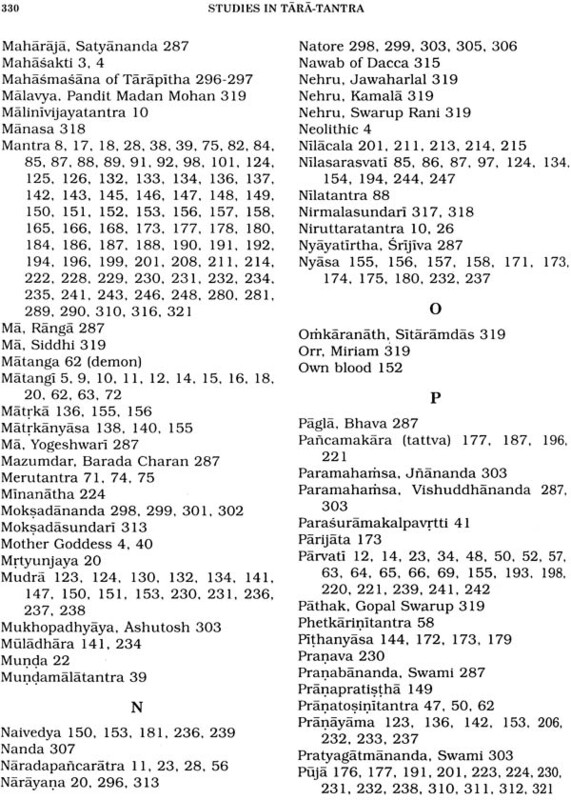 The number of the Tantric scholars, the researchers, the readers, the Tara devotees and worshippers and the followers of the followers of the Dasamahavidyas is increasing day by day throughout the world. 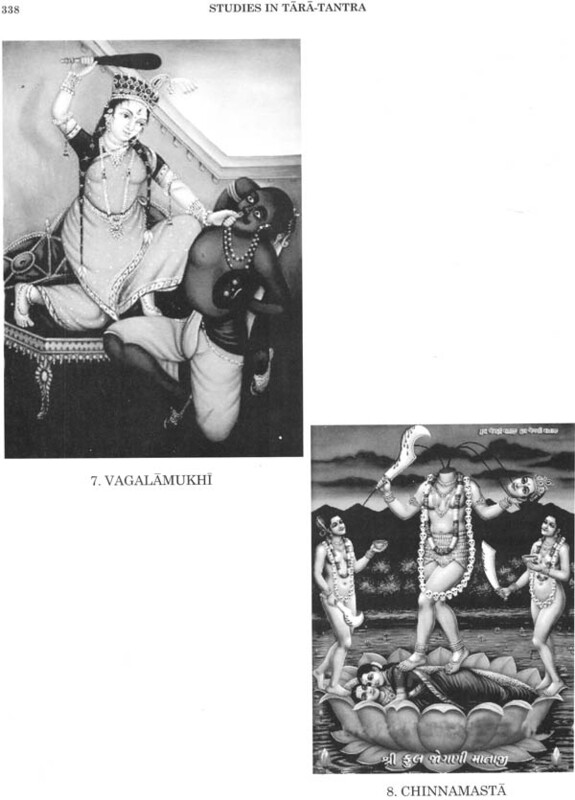 Many inquisitive foreigners visit Benaras (Varanasi), Kamakhyaksetra, Kalighat, Dakshineshwar and Tarapitha every year in order to quench their thirst for the Tantric cult. 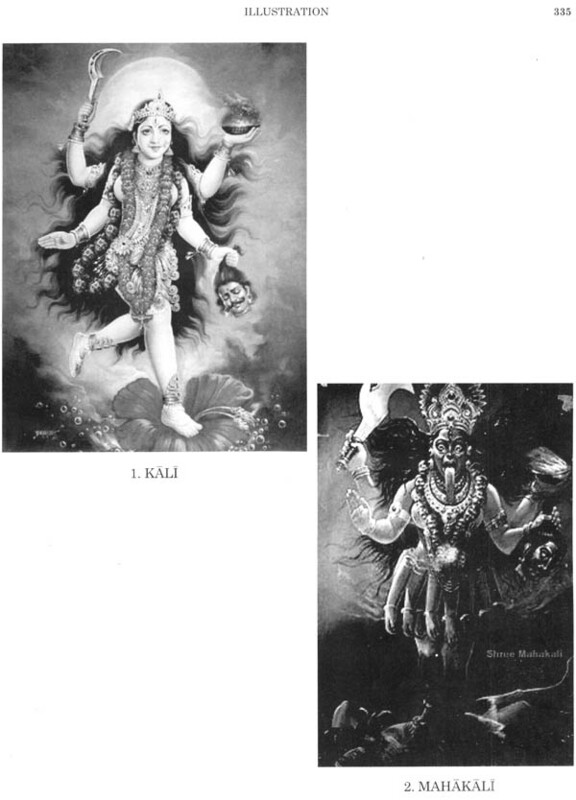 Though this book deals with Hindu Goddess Tara, the Buddhist Tara devotees specially the Tibetan Tara worshippers may find some similarities between the Hindu Tara cult and the Buddhist Tara cult. This herculean task would not have been successfully performed if my dearest and nearest ones had not helped me in various forms and different ways. I may fail in my duties if I do not acknowledge their contributions. Mr. Prashanta Kumar Bhattacharya, propreitor of Punthi Pustak, Kolkata, deserves my first thanks for his inspiration. It is the interest and the intiative taken by Mr. Bhattacharya have made the publication of the book possible. 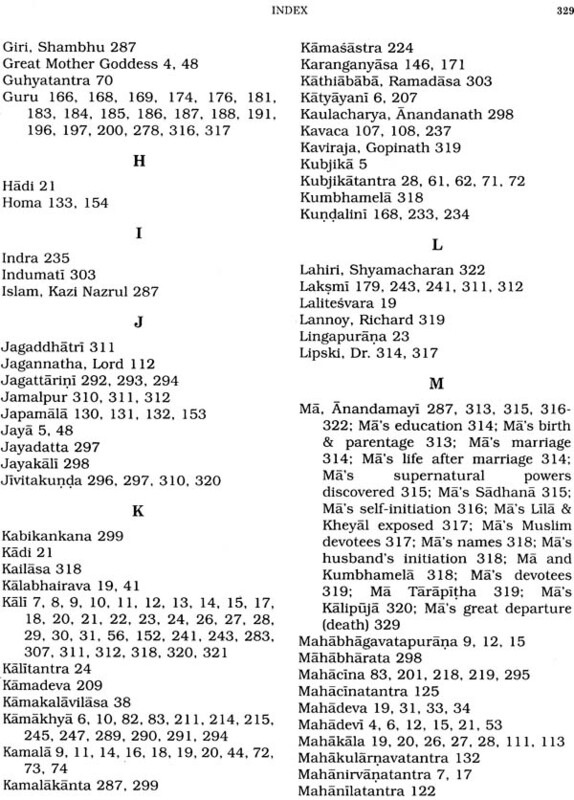 I have culled the material of my book from many books, but four books to which I am specially indebted are Upendra Kumar Das's Sastramulaka Bharatiya Saktisadhana, Acarya Brahmananda Giri's Tararahasyam, Bipul Kumar Gangopadhyaya's Mahapitha Tarapitha and Alexander Lipskfs Life and Teaching of Sri Anandamayi Ma. I offer my deep gratitude to Swami Sadhanananda Maharaja of Bharat Sevashram Sangha, Prof. Rajendra Nath Sarma, Former Head of the Department, Department of Sanskrit, Gauhati University, Pankaj Datta and Paritosh (Pallab) Datta (Cossimbazar, Murshidabad), Sanjay Bardia (Kolkata), Sumita Saha (Munny, Jagi Road), Tapash Roy, Tapan Saha, Tanushri Majumdar, Dr. Narayan Chandra Saha (Kharupetia), Nripen Sarkar (Chikonmati Tea Estate), Bhupendra Nath Borah (Department of Geography, Kharupetia College), Nazir Hussain Sarkar and Nilak Rajbongshi (Department of Assamese, Kharupetia College) for their inspiration and help. I take this opportunity in recording my heartful thanks to the Principal, all the professors, the non-teaching staff, and the students of Sanskrit Department of Kharupetia College for their encouragement. 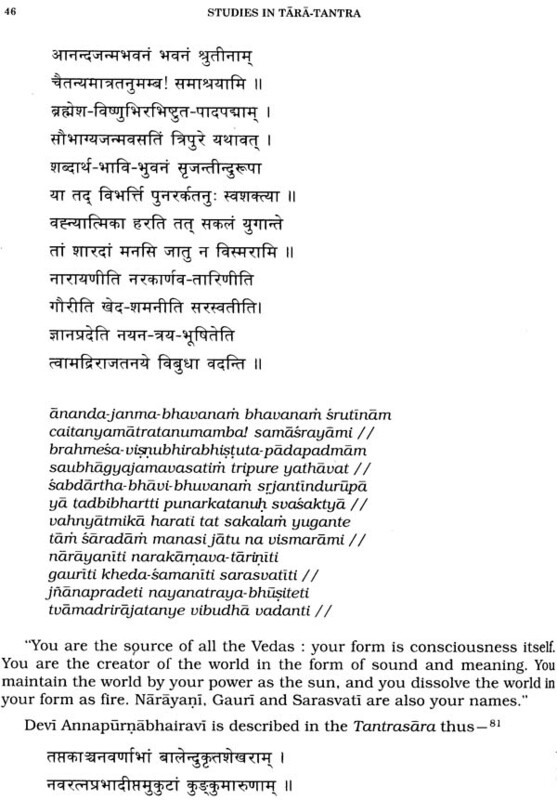 I am thankful to my wife Srimati Jyotsna Datta for her unending and ungrudging help in translating my dream into reality. 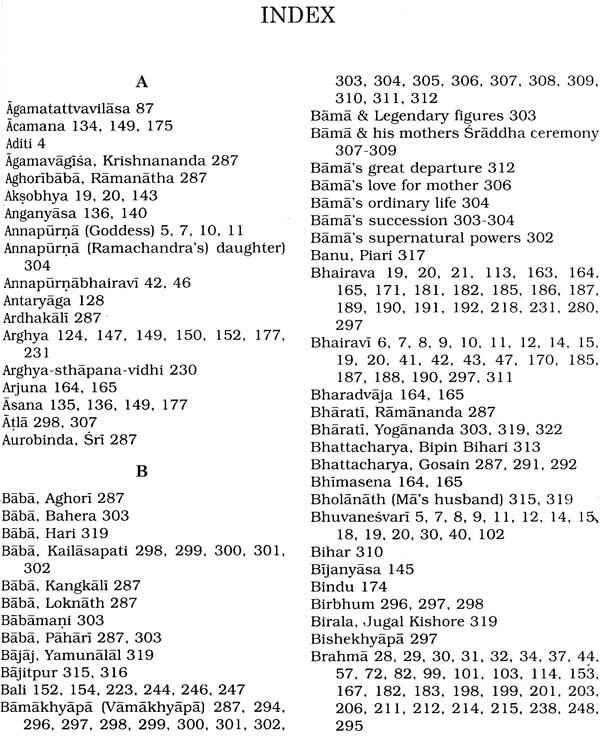 Pratik Datta, Shubham Datta, Abir Datta, Palash Brahma, Ramakrishna Brahma (Cossimbazar), Pranit Roy, Pranay Roy, Prameya Saha, Bismita Saha, Rahul Kar, Sayan Saha, Shubha Saha (Kharupetia), Jaydip Datta (Mumbai), Banosree Saha, Pradip Sarkar, Chandrama Devi, Gautam Biswas, Vaibhab Surana, Madhura Datta, Mamata Shethi (New Delhi). I will deem my labour amply rewarded if the book serves the need of those for whom it is meant.